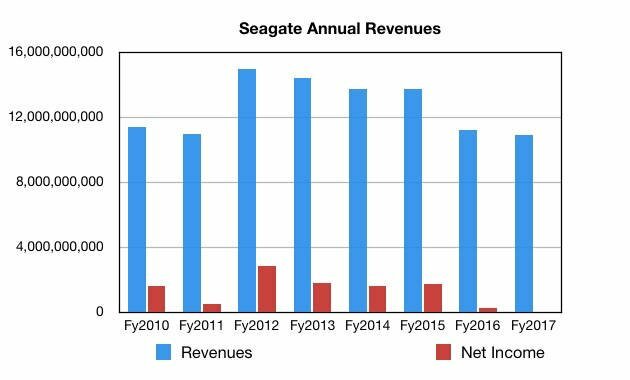 Seagate made a canine evening meal of its third 2017 fiscal quarter – with flattish revenues on the annual compare greeted by a disappointed Wall Street expecting more and marking the shares down 15 per cent. The full year revenue is likely to show an annual decline as well. Chairman and CEO Steve Luczo’s company recorded $2.7bn in revenues, up 3 per cent year-on-year from $2.6bn, and seasonally down from the previous quarter’s $2.89bn. Net income of $194m was a great turn-around from the $21m loss reported a year ago. Gross margin was 30.5 per cent and cash flow from operations was $426m. Disk drives accounted for $2.4bn in revenues with $250m coming from enterprise storage arrays, SSDs, and other odds and sods. Oddly and unusually, Seagate did not provide the number of disk drives shipped in its results data. But it did say it shipped 65.5EB of total disk capacity with the average capacity per drive being 1.8TB. Dividing the latter number into the former gives us 36.39 million drives. A year ago it was 39.2 million and a quarter ago it was 39.9 million. It also did not provide disk unit ships per disk market sector, and stated it “will discontinue providing unit detail” in future, asserting that capacity shipped is more relevant. That means comparison with previous quarters is made more difficult and, as exabytes-shipped is likely to rise, looks more positive than likely declining unit ship numbers. In the earnings call, Seagate said that less than 10 per cent of its hard disk drive portfolio was exposed to flash competition and that percentage would be even lower next year. Exploiting the tech industry's flight to flash is a deliberate strategy by Seagate. It believes higher sales of devices with flash storage in them are good for its disk drive business – as it means more content has to be stored centrally somewhere on disk eventually, such as in the public cloud. For example, folks with 64GB of solid-state capacity in their Chromebooks will be slinging their photos, videos, and other documents, onto Google's systems, so their data will eventually land on disk. Luczo said Seagate's HAMR technology leading to 16TB and 16TB+ drives would now arrive in late 2018. He thinks it has a technology advantage in 1TB drives, and also pointed out it’s moving to 4th-generation SMR (shingled magnetic recording) technology. Some 40 per cent of its drives use SMR. In the SSD area it sees between $40m and $50m of potential revenue being held up because it can’t get the flash chips it needs. Contrast this staid approach with Western Digital’s much more dynamic approach to flash drives and systems and it looks like Seagate is more of a dull cash and cash-flow generator than an exciting high-tech growth business. Overall the earnings call came across as a muted, going-through-the-motions affair. The outlook for the next quarter was for revenues between $2.5bn and $2.6bn, meaning a year-on-year decline from the fiscal 2016 Q4’s $2.7bn – a $150m drop at the mid-point. Full fiscal 2017 revenues look to be $10.9bn at the mid-point, which would be a 2.5 per cent decline from fiscal 2016’s $11.2bn.